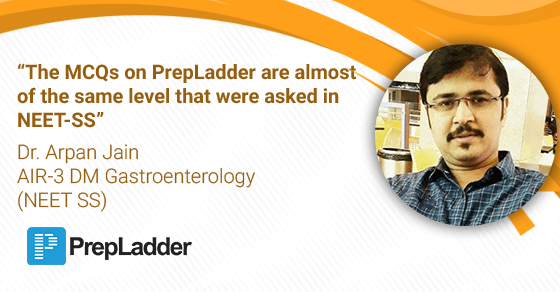 PrepLadder congratulates Dr. Arpan Jain on securing Rank 3 in DM Gastroenterology NEET SS. We wish him all the best in his career and future ahead. Myself Dr. Arpan Jain, I got 3rd rank in DM Gastroenterology NEET SS. I did my MBBS from Government Medical College, Nagpur and PG degree in General Medicine from Pt. Jawaharlal Nehru Memorial Medical College, Raipur in 2015.I directly started doing private practice since then for almost two and half years until December 2017. During my practice I realized that, I need to do DM as the opportunities are decreasing for General Medicine and more number of patients are now being referred to specific specialties. My dream subject for specialization was Gastroenterology, so prepared for the same. What do you think is the correct approach to study for NEET SS? Only MCQ's or Theory+ MCQ's? I read 18th edition of Harrison during my post graduation. It was very tough for me to cover up the 19th edition in 2 months and to revise it again. So I just went through the tables in 19th edition along with some extra points.. I solved all the PrepLadder MCQs for NEET SS DM. Also went through free PrepLadder MCQs in Medicine for NEET PG. For me there was a lot of inertia to start. I began in January 18 and my studies came into flow in March. If you are fresh with the textbook, I think 4 months of daily 8-10 hours with your own unique strategy is more than enough. Last year I just appeared for the NEET SS... without reading anything and hence wasn't selected. See you should practice maximum number of MCQs from whichever platform you get. Because one can read textbooks for hours but once you solve the MCQs it remains in your memory for long. For me PrepLadder was the best platform providing references from Harrison 19th edition. I bookmarked the Mcqs which I got wrong in first attempt and revised them again and again even when I was not on my study table, like while travelling and doing some other activities. I have already mentioned above that studying for 8-10 hours a day is enough. Definitely, I read the whole subject till May. And from June till the exam i kept on revising the same again and again. The MCQs on PrepLadder are almost of the same level that were asked in NEET-SS. The explanations given are straightforward lines from standard textbooks. So that helped me to consolidate my theory part. I was a topper.. But leaving studies for some years in between pushed me back to the average level. Most difficult subjects for me were Endocrinology and Neurology. Hematology, Nephrology, Cardio was pretty easy. Gastroenterology became somewhat easier by reading standard textbooks. You should dedicate ample time for revision. Atleast 3 revisions must be done. As u revise again and again the time for subsequent revision automatically decreases. Some last tips for our readers preparing for NEET SS. Keep reading hard and believe in yourself. Don't ever give up because "DREAMS DO COME TRUE"
We thank Dr. Arpan Jain for sharing his success story.